¶ 1 Leave a comment on paragraph 1 0 In contrast to the Lexington and Concord series which elevated the white citizen-farmer-soldier to the status of national hero, the 1928 Valley Forge anniversary stamp represented a mythical story about General George Washington that made him seem humble, like a common man. 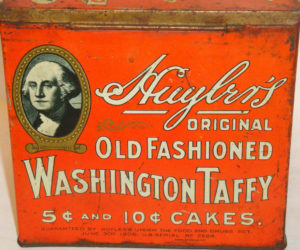 ¶ 2 Leave a comment on paragraph 2 0 Washington’s name and face were used by companies to sell many different products, such as taffy. ¶ 4 Leave a comment on paragraph 4 0 Supporters of the anniversary encampment at Valley Forge wanted to incorporate this familiar image on a stamp and began petitioning the USPOD in the mid-1920s. Malcolm H. Ganser asked in a letter to the editor of the New York Times for other readers to write to a very reluctant Postmaster General to sway him into printing a stamp commemorating this event. Requests were honored and the image of Washington kneeling in prayer would represent the anniversary at the encampment even as Rupert Hugues and other historians began questioning the accuracy of that scene. 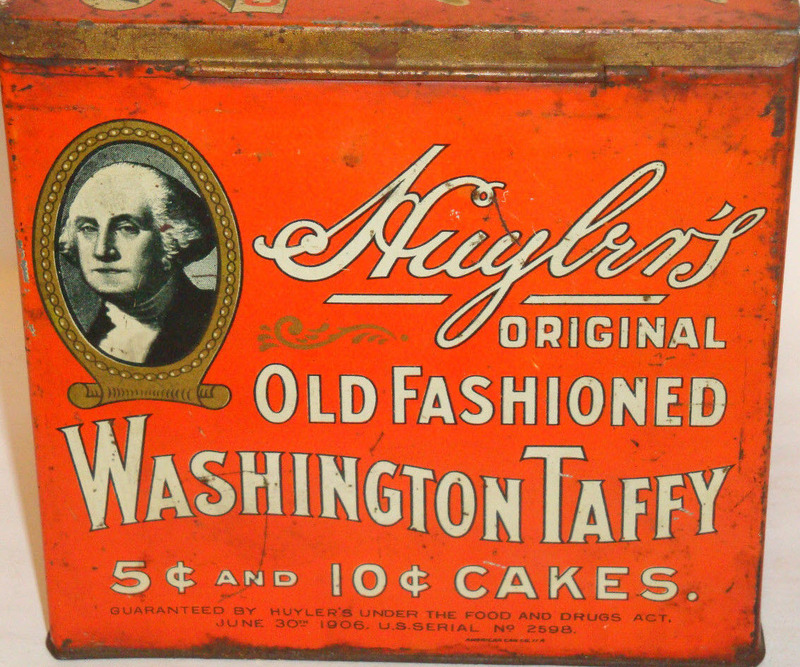 One newspaper columnist opined there was “no good reason to doubt,” and another stressed that neither the stamp engraver nor historians were at Valley Forge with Washington, so why would he doubt Washington’s actions?2 The myths of Washington were difficult to challenge in public. ¶ 5 Leave a comment on paragraph 5 0 Hughes was a biographer of Washington and was extremely critical of those wishing to mythologize Washington. 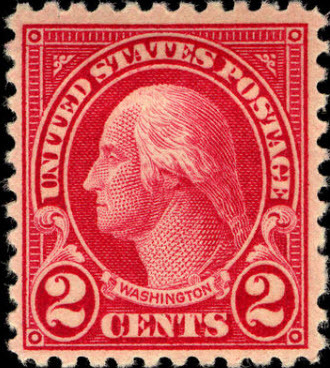 Hughes and others criticized the stamp because they recognized that the government held immense power by endorsing images that stamp consumers might assume to convey historical fact. Interestingly, while Hughes was concerned about representations of the general and president, others were thankful that remembrances of the Revolution were not solely militaristic. 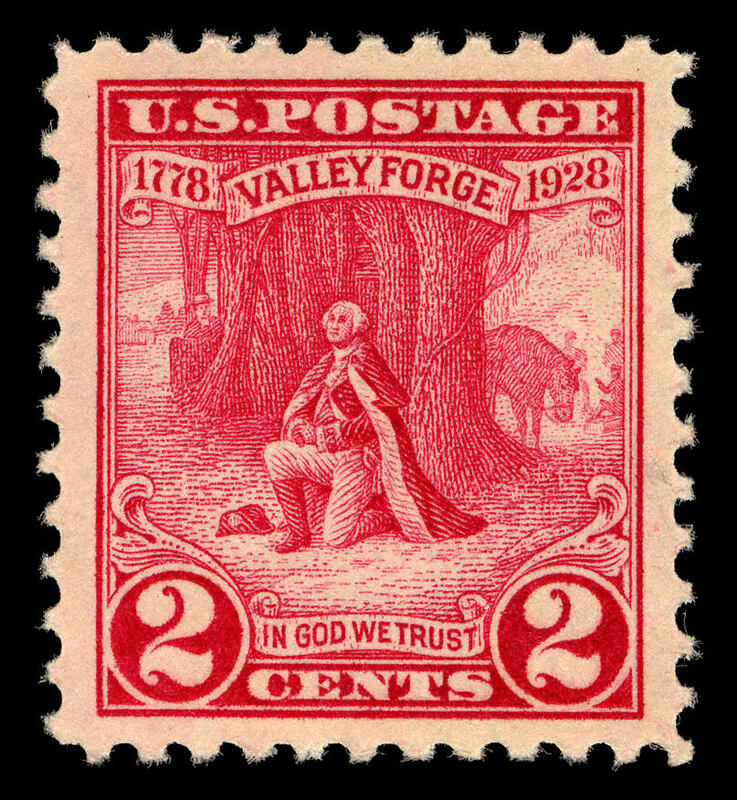 ¶ 8 Leave a comment on paragraph 8 0 The stamp engraving is a voyeuristic view of Washington kneeling in prayer in the woods surrounding the Valley Forge encampment as if from the perspective of Issac Potts, who was shown hiding behind a large tree. According to Weems’s tale, Potts was delighted when he came upon Washington praying in the woods. Potts decided at that moment that he could support the Revolution because Washington demonstrated that one could be a Christian and a soldier without moral conflict.4 This image provided a comforting message for some. Washington kneeling at Valley Forge also spoke powerfully to those who believed that the United Sates was not only a Christian nation, but one that benefited from the Grace of God during hard times. ¶ 10 Leave a comment on paragraph 10 0 Four printed words solidified the notion that the entire nation believed in God: “In God We Trust.” These four words distinguished this stamp from any others printed at the time. This phrase appeared on contemporary U.S. coins, but never on stamps. 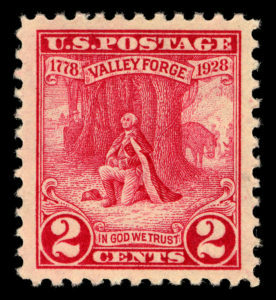 It would not be until another Red Scare in the 1950s when a stamp, this time a definitive, carried the motto.5 On the Valley Forge stamp, however, the phrase acts as a label interpreting the scene telling consumers that this is why we trust in God, because Washington trusted in God and the U.S. reaped the blessings of independence. Any debates over Washington’s religious beliefs or his aversion to prayer were settled in the minds of some Americans because the USPOD printed and circulated this interpretation of Washington’s private life. ¶ 13 Leave a comment on paragraph 13 0 Instead, they chose the Weems-inspired image of Washington in prayer. ¶ 14 Leave a comment on paragraph 14 0 We can see from the Revolutionary War Sesquicentennial commemoratives that the UPSOD glorified individuals and selective battles to instruct Americans, immigrants, and international collectors as to what and who was important to remember. Other stamps reflected similar patterns in design and message. Common white men were the heroes, and leaders were not elites but rather depicted as strong men who walked among their soldiers, and sometimes prayed. Seeing these stamps representing Revolutionary War men motivated other heritage and hereditary-based groups to pursue commemoratives for their humble heroes. Of course, George Washington was one of the wealthiest men to become president and owned more than 120 slaves at Mount Vernon. As you note, the effort to depict him as a “common man” reflects how postal authorities sometimes engaged in mythmaking with stamps. Do such such depictions advance a democratic culture? Is it better for authorities to acknowledge that Washington was a wealthy elite who, despited his background, felt deeply about fathering the nation? Definitely, as an engine of the government, the USPOD has an investment in perpetuating these types of myths, because it helps to foster a sense of national identity. But, I don’t think postal officials saw these as myths, necessarily. Or, it didn’t matter if those were myths, because the images and stories offer positive messages.